This stunning image of the Milky Way was taken over Mt. Manaslu in the Himalayas in fall of 2014. This stunning image of the Milky Way was taken over Mt. 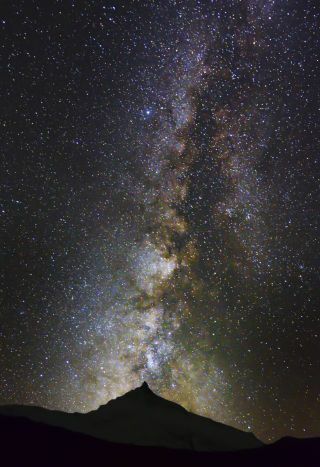 Manaslu in the Himalayas by an amateur astrophotographer with a passion for climbing. Computer scientist and part-time mountaineer Kuntal A. Joisher, of Mumbai, India, took this image in fall of 2014 during a trek on the mountain. The Milky Way is a barred spiral galaxy about 100,000 light-years across. Spiral galaxies make up about two-third of the galaxies in the universe. The spiral arms contain a high amount of dust and gas and constantly form new stars. These arms are contained in what is called the disk of the galaxy. It is only about 1,000 light-years thick.